Directions (1 – 5): Study the given information and answer the following question. In a hospital, there are seven doctors: A, B, C, D, E, F and G. They work in different departments such as ENT, Neurology, Pediatrics, Gynecology, Orthopedics, Cardiology and Dermatology but not necessarily in the same order. All the departments are in different Floors namely Floor 1, Floor 2, Floor 3, Floor 4, Floor 5, Floor 6 and Floor 7, but again not necessarily in the same order. A is on Floor 5. D works in the department of Dermatology. The doctor who works in department of Orthopedics is on Floor 2. The doctor who works in department Pediatrics is on Floor 6. F does not work on the 6, 2, 1 and 4 Floors. F does not work in department of Cardiology, Neurology or Gynecology. C does not work in the department of Orthopedics and he is not on Floor 4 or Floor 1. Neither D nor G belongs to Floor 1. A does not works in department of Neurology. The doctor who is on Floor 3 work in department of Cardiology. B works in Pediatrics department. E works in Neurology department. 1. Who among the following is in the Floor 7? 3. 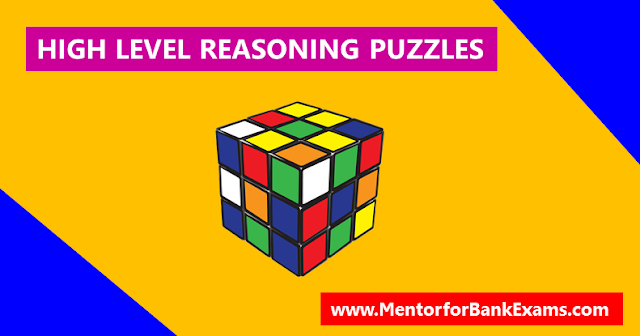 Which of the following combination is true according to the above information? 4. Who among the following works in department of Cardiology? 5. Which of the following is true about G? A, B, C, D, F, G, H and K are eight villages in a taluka. They are located in such a way that villages B, G, K, H are at the four vertices of an imaginary rectangle and the remaining four villages are at the four vertices of another imaginary rectangle obtained by joining the midpoints of the earlier rectangle. K, H and F are on one of the shorter sides. And G, A and H are on one of the longer sides. 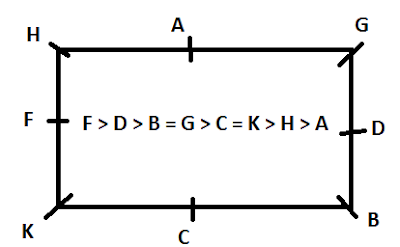 D is not towards left of B. F is towards the left of K and G is towards the left of H, the populations of villages C and K are equal whereas those of villages B and G are also equal. The population of village D is the second highest. The population of village H is more than that of village A and less than that of K, the population of village G is more than that of C. None of these pairs of villages is the highest populated. 6. The population of which of the following villages is the highest? 7. Which of the following villages is exactly in between the villages A and C? 8. If an imaginary right angled triangle is drawn, which of the following villages will be at one of the vertices of outer rectangle as well as the triangle in addition to K and H? 9. The population of how many villages is less than that of village G? Eight friends - P, Q, R, S, T, U, V and W are sitting in a straight line, but not necessarily in the same order. Some of them are facing north and some others are facing south. Only two persons are sitting to the left of U. Only three Persons are sitting between U and T. Both the immediate neighbours of T faces south. P is sitting second to the right of S. S is not an immediate neighbour of U. Only one Person is sitting between P and W. O is sitting to the immediate left of V. Q is not sitting at any extreme ends of the line. R is sitting third to the left of Q. Both the immediate neighbours of R faces opposite directions. R and T face the same direction as that of V.
11. Four of the following five are alike in a certain way and hence they form a group as per the given arrangement. Which one of the following does not belong to that group ? 12. What is the position of P with respect of Q ? 13. Which of the following Pairs of persons sits at the extreme ends of the line ? 14. Which of the following statements is true regarding R as per the given arrangement ? 15. Which of the following represents the positions of P with respect to U ? 11. B) Except U, all others face south. 12. E) Q faces north, P sits fourth to the right of Q. 13. A) V and S are sitting at the extreme ends of the line. 14. C) S faces south. R sits third to the right of S.
15. D) U faces north. P sits third to the right of U.